Matthew Parker is the Owner and CEO of Independent Security Advisors, a certified disabled veteran owned company based in Maryland that provides consulting, training and other services on matters of national security & terrorism, extremism, domestic violence and executive or diplomatic protection. Mr. Parker also serves as the Director of Training and Master Instructor for the ISA Dignitary & Executive Protection program. He is a certified law enforcement instructor for dignitary protection accredited by the State of Maryland, and a US Army Master Instructor. Mr. Parker joined the US Army in 1990 as a reconnaissance specialist, and successfully served in every duty and leadership position of that career field. But in 1993 Mr. Parker was selected for special assignment and completed his initial protective operations training with the US Army. From 1993 to 1997 Mr. Parker was assigned to various short term protective assignments for the US Army, and with his commands approval started working with civilian security contractors locally. In April 1999 on completion of advanced protective operations training, Mr. Parker was selected for special duty and assigned as the protective service agent and detail leader for a US Army Task Force Command deployed as part of the stabilization force in Bosnia and Herzegovina (SFOR) a NATO-led multinational peacekeeping force. In January 2001 Mr. Parker was selected to serve as the senior instructor and course manager for the SFOR 9 Personal Security Detail course training US Army Reserve and National Guard soldiers in protective operations for Bosnia. While in Iraq in 2004 Mr. Parker working with the International Police Task Force assisted with the creation of an IPTF diplomatic security training program and in writing the curriculum. This course in northern Iraq trained Iraqi security officers in close protection for military commanders, local and regional Kurdish and Iraqi civilian officials. In June 2007 Mr. Parker was assigned as an instructor with the Iraqi Army Commando School and in October 2007 Mr. Parker was selected to oversee site security of the Baghdad Reconciliation Conference, and to manage the personal security arrangements of the delegates. Other notable assignments include serving as an instructor on Ft. Leonard Wood in 2001-2002, and later as the director and master instructor for the chemical warfare specialist training department of the US Army Chemical School on Ft Leonard Wood in 2003. In 2010 Mr. Parker was assigned as an assistant professor of military science & leadership with the Army ROTC program of Virginia Tech University. He retired from the US Army in May 2011, highly decorated and with over twenty years of honorable service. His tours of duty include Europe, Korea and the Middle East with multiple deployments to Iraq. Mr. Parker was awarded the Bronze Star and Meritorious Service Medals during his service and has received special recognition from the Government of Iraq and the US State Department. After his work with the Iraqi government’s dignitary protection training program, Mr. Parker continued as an special advisor to the director of security for the Deputy Prime Minister and Minister of Finance for the government of Iraq until 2012. Mr. Parker now occasionally works as a subject matter expert and consultant to the Gerson Lehrman Group, and proudly serves on the board of MS Global Partners LLC as the national security advisor and senior consultant. Mr. Parker is also an associate member & SME to the Institutional Investors Consulting Company, providing advice and guidance on matters of diplomatic protection, terrorism and international commerce security. This organization provides funding and management of various projects internationally improving the lives of millions of people. 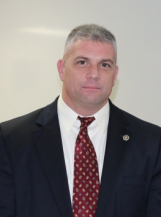 Mr. Parkers work in the private sector includes serving as the first director of the executive protection division for Centurion Security Services of Baltimore Maryland and Director of the Protective Studies Program for the University of Maryland Public Safety Academy and Mount Eagle College. Mr. Parker has also served as an independent consultant and close protection agent for foreign diplomats & trade delegations as well as to corporate executives, celebrities and professional athletes. Mr. Parker is a DOD accredited anti-terrorism, physical security and diplomatic/executive protection specialist, and is a graduate of the Federal Law Enforcement and US Army Law Enforcement Training Academy’s as well as the US Army Chemical School. He has received specialized training in close protection, counter/anti-terrorism and chemical, biological, radioactive and nuclear (CBRN) incident response. Mr. Parker’s civilian education includes studies in leadership and communications with Central Texas College, Political Science and religion with Columbia College and Homeland Security with a minor in Emergency Management with the University of Maryland. Mr. Parker received his training in international and governmental affairs, business management and executive leadership with some of the top mentors in the field of diplomacy and public policy, security and education.